Pictured above are Prof. Aoife McLysaght, Laura Mahoney, Royal Irish Academy, Alistair Blair, Accenture, Prof. Lydia Lynch, Eithne Harley, Accenture, Pauric Dempsey, Royal Irish Academy, Dr. Aoife Gowen, Prof. Sarah McCormack, and Andrew Hetherington, Business to Arts. Picture by Shane O’Neill Photography. 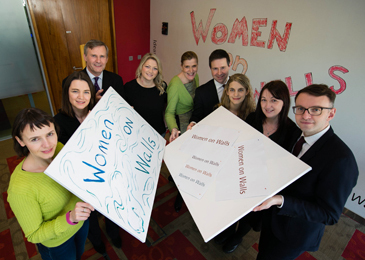 Women on Walls is a campaign by Accenture in partnership with the Royal Irish Academy that seeks to make women leaders visible through a series of commissioned portraits that will create a lasting cultural legacy for Ireland in 2016. Accenture is commissioning five portraits of leading female academics to recognise their achievements and inspire future generations. The finished artworks will be on public display in the Royal Irish Academy, the first portraits of female subjects to grace the walls in the Academy’s 230 year history. The five portraits will consist of four individual portraits of the first four female Members of the Royal Irish Academy, elected in 1949. The fifth portrait will be a group portrait of eight female scientists, who are recipients of the European Research Council Starter Grants 2012 – 2015 and have been chosen as representatives of a generation of outstanding young female scientists working in Ireland today. For more information, please download the Submission Criteria & FAQ and click here to complete your Entry Form.